The dual socket HP ProLiant DL380p G8 server is a great choice for the small to mid sized business in need of state-of-the-art enterprise-class application performance in an energy efficient 2U rackmount footprint. Harnessing the power of the latest Intel Xeon E5-2600 series quad core, six core and eight core processors, up to 768GB of DDR3 RAM and up to 48TB of SATA, SAS or solid state storage across either 8 or 12 large form factor, or 8, 16 or 25 small form factor hot-plug drive bays, the HP ProLiant DL380p G8 provides tremendous value, configuration flexibility and performance while staying within your budget. Highly efficient redundant power supplies, up to six PCIe slots (3-5 of which are Gen 3) providing powerful and flexible I/O options and a choice of quad onboard gigabit or dual 10Gb NICs round out the impressive feature set of the HP ProLiant DL380p G8. 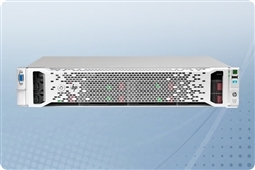 Whether deploying a web, application, database or virtualization server, the HP ProLiant DL380p G8 is a fine choice for the SMB or enterprise alike. Aventis Systems carries the HP ProLiant DL380p G8 in both Aventis Certified Reconditioned as well as New condition. All servers from Aventis System include a 3 year Comprehensive Warranty, with eligibility for optional Express warranties and onsite services. 3TB (12 x 250GB) 10K 6Gb/s SATA 2.5"